Look classy and smooth. Love em. Decorate your home with this fabulous curtain panel. 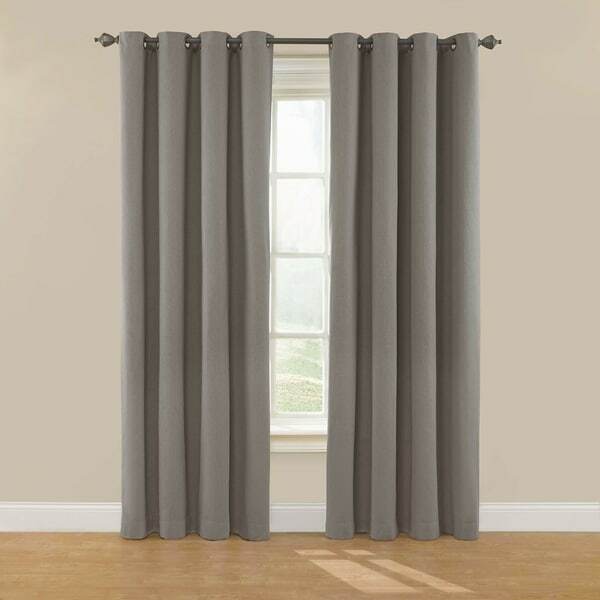 This cotton blend curtain panel comes in smoke, linen or smoke to blend with your home decor. The solid design adds to its stunning style. Transform any room in your home with the Eclipse Nadya blackout curtain. Independently tested, eclipse offers a superior blend of window fashion design and blackout technology for any decor. Update the bedroom, living room or dining room and enjoy the light blocking, noise reducing, energy-saving benefits of Eclipse. Perfect for daytime sleepers of all ages, home theater enthusiasts, and energy saving conscious home owners, Eclipse curtains offer style versatility for any living space. The patented Thermalayer process transforms ordinary drapery panels into a light-blocking, noise-reducing, energy saving solution for the home. 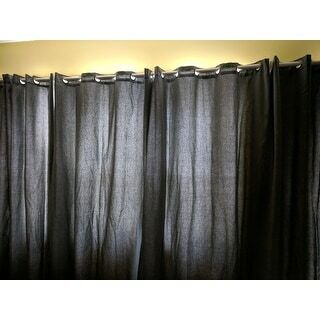 An independent blackout layer lines the back of the curtain fabric to enhance the window treatment while allowing for the same drapability of naturally flowing curtains. Hang eclipse curtains in any bedroom to achieve an optimal sleeping environment. Each Eclipse Nadya grommet panel measures an extra wide 52 inches in your choice of 63-inch, 84-inch or 95-inch lengths. 1.5-inch antique bronze grommet accommodates a 1-inch rod. Faux linen woven drapery offers a textured hand with faded medallion all-over print. Hang two drapery panels on decorative curtain rod for optimal light-blocking coverage and decorative style. Color was not as pictured but I kept them anyway. They do an excellent as black out and also have helped in the insulation of my large window in the winter from the cold and the summer from when I get direct sunlight into my apt. My air conditioner worked more efficiently when I had these curtains this year. The curtains are not as dark as shown.. more of a light greyish beige. Happy with the quality of the curtains.The packaging said to put them in the dryer on low with a damp cloth to get rid of wrinkles. This made them shrink slightly. I ordered a set for my bedroom because the sun comes in bright and early, and now it's heaven not having to deal with it. So i ordered another set for my other bedrooms. The fabric is very nice--looks like a cotton/linen blend. I would call them room darkening rather than blackout, and that's why I gave them 4 stars rather 5. Since I needed six panels price was a big concern, and these are a great product for the cost. I would buy them again. I haven't tried ironing or steaming them--I'm hoping most of the wrinkles will fall out. Very pleased with these curtains. The material is not too heavy (which is good) but does a great job blocking the light. This picture is in the morning. Not 100% blockage but I’m very happy! Really block out the light! Very good quality for the price! Using for our back sliding door - totally blackout - great for movies! Great black out panels. I purchased for when my grand daughter visits to darken her nursery. It works great! As far as quality the curtains were fine, but I ordered six and three were one shade of gray and the other three a very distinctively different hue of gray. I will be returning three. "what is the color of the back?" The back of this item consists of a white lining.